Elizabeth and I went to Skyline Chili and had Cincinnati style chili for dinner Friday night. We both had 5-way Chili—which in Cincinnati is a base layer of spaghetti with beans, onions, and meat. There was also a deep layer of cheese on top of it—making it impossible to see anything else on the plate. 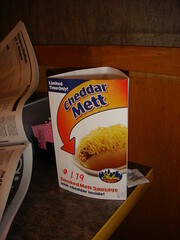 Each table also had a table tent promoting the “Cheddar Mett”—a diseased looking sausage oozing cheese. The last time I saw something oozing crap like that I told the guy that I wasn’t interested and ran as fast as I could. Saturday morning after our tour of the National Underground Railroad Museum, I was standing in the shower thinking about my time at the museum and it suddenly struck me that the museum had very little about the underground railroad. It was actually quite disappointing on that level. They are too focused on trying to cure society’s racist, sexist, and religiousness ills and spend too little time focusing on the actual interesting history that is the underground railroad. The National Underground Railroad Museum has an introductory movie in an incredibly uncomfortable theatre. The seats are too narrow with arm-rests that pinch at your sides. This was in stark contrast to the seats at the Creation Museum which were incredibly comfortable, complete with vibrating goodness. The Newport Aquarium, our second stop, was packed to the gills. Too packed: they let too many people in and we were claustrophobic. We were staying at a hotel out by the airport. Apparently people in Cincy like to get married at airport hotels—not just receptions, but the actual vows. It seems so romantic to me that one would choose to get married at an airport hotel. The gift that keeps on givin’! When In Cincy I go to GoldStar Chili and Frisch’s Big Boy. Next time try to visit the Old world style market. Over the years I have stayed at Stouffers Cinicnnati Inn, The Omni Cincinnati, and the Millennium and they are all the same place. I think skyline is pretty good. I could be wrong but I thought that goldstar and skyline were owned by the same people. I’ve been to both and they are indistinguishable from what I can tell. As far as the aquarium goes…I had to go there on a field trip for one of my undergrad classes. It’s actually a nice place if it’s not too full. When I went it was really empty (early am) and by the time we left I wanted to cry because there were so many peoples. eeeeps. @ed: if the millennium cincy is anything like the millennium CDG, it’s a nice airport. I’ve had gold star at the Cincy Airport. @koko: they must be owned by different people, even if they are the same taste. @chase: it’s not gorgeous, it’s… common and down home good.